Geoengineering using Chemtrails and HAARP will only makes him mad … real MAD! Hollywood writers and famous novelists alike are notorious for cloaking their social commentaries, political satires and environmental advocacies with the garb of monsters. These “Monsters with a Message” have been visiting Planet Earth for as long as there have been very serious reasons to save the human race from itself. Frankenstein, King Kong and Godzilla are all perfect examples of how Hollywood monsters have come as celluloid messengers to help, not hurt, humankind. 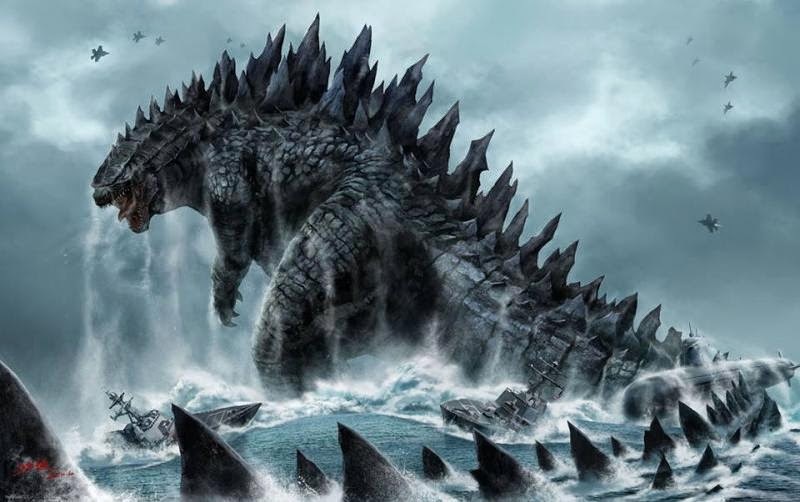 As menacing as Godzilla looks on the silver screen, he has entered our consciousness in order to warn us of the consequences of our collective destructive behavior. In 2014 the entire planetary civilization serves as his apprehensive audience, since the internet has made possible global dissemination of his serrated and ever-looming profile. In this way, the many residents of the planet who actually see him in action will make sure those who don’t, at least hear about his city-demolition sprees. The great thing about the Monster Movie genre is that you often receive the streaming of subliminal messages with the sound turned off. In this way there are no language barriers toward understanding the true import of Godzilla’s universal meaning. The position of this essay on the Global Warming issue is unequivocal; therefore, we highly recommend a complete reading especially for those who have their doubts. At the very least go see Godzilla and imagine that the whole flick is really about Global Warming, and the deleterious effects of Geoengineering via Chemtrails and HAARP. 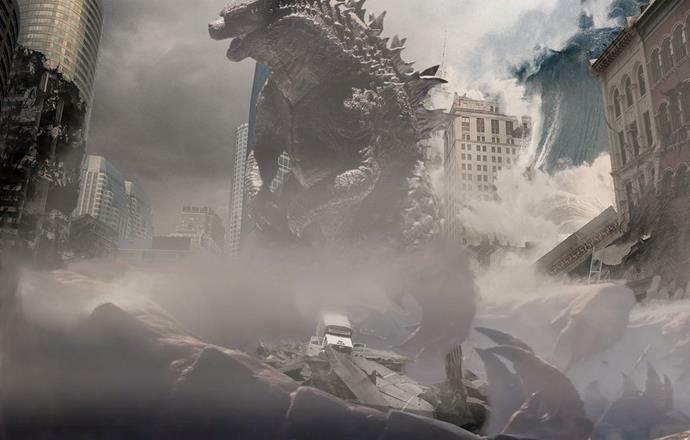 Look closely at all the destruction that Godzilla inflicts on the cityscapes and landscapes, which can be viewed as a metaphor for the damage wrought by unrelenting Global Climate Change. Many a frame of the Godzilla reel captures destruction not too unlike that which Global Warming is causing around the globe. Likewise, many a digital screenshot portrays the ongoing damage that geoengineering is producing worldwide. To deny such obvious and calamitous weather events, which are now occurring at an ever-increasing rate across the planet, is to do so at our peril. What cannot be accomplished in the Parliaments and Congresses of the world will be carried out in the domain of public discourse. Young minds are by their very nature more open and impressionable; hence, they can more easily apprehend the truth especially when presented by way of a thoroughly engrossing monster movie that is replete with subtle and encoded messages. Since the children of today stand to suffer the most from the stubborn inaction of the older generations, they do have a very serious stake in the outcome of this saga. Perhaps they will get the story straight (via allegories like Godzilla) … once and for all. As for the world’s adult population, the photo below nicely reflects their current state of awareness and commitment to act. Not only are many politicians confused about the true causes of the relentless Global Warming pattern, they have a vested interest to act confounded. Were they to simply open their eyes, they would see weather patterns that are completely unprecedented and unparalleled, wildly unpredictable and volatile. Also, they would witness weather events of great consequence jumping off anywhere and everywhere they look across the planet. Nevertheless, the capitals around the world are more preoccupied with debating whether Global Warming really exists! 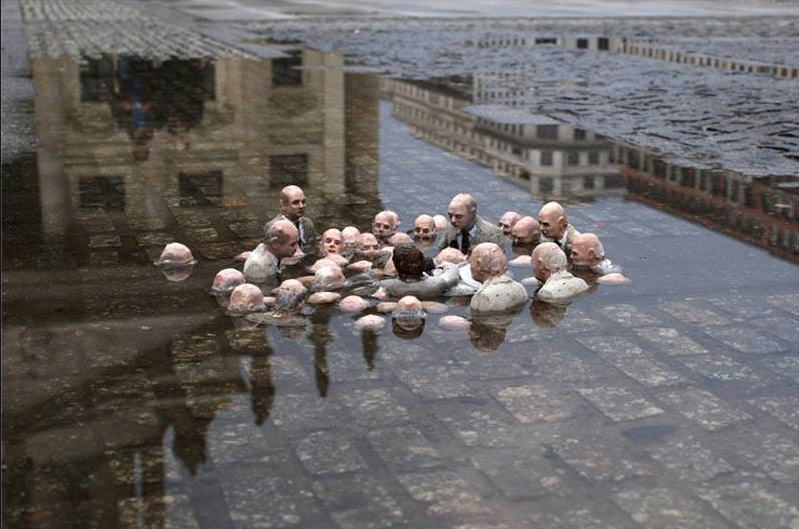 This sculpture in Berlin by Isaac Cordal is called “Politicians discussing global warming”. 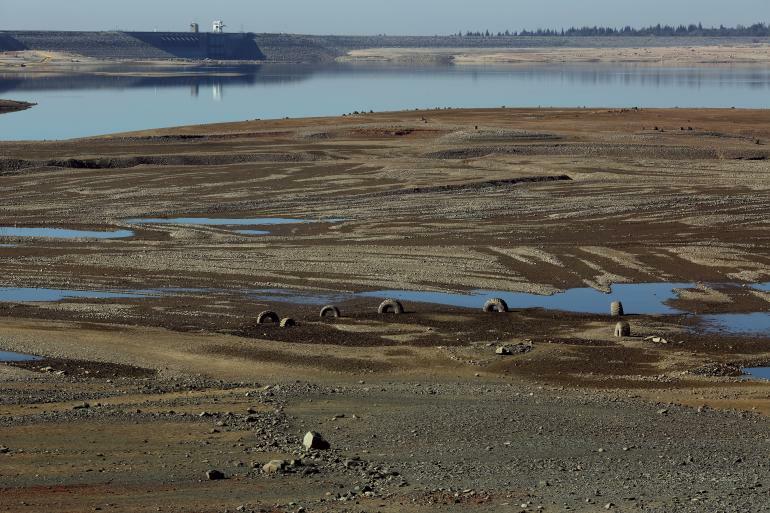 Clearly, the worldwide Hydrological Cycle (also known as the Water Cycle) has been on the fritz for the last few decades and shows no signs of normalizing. 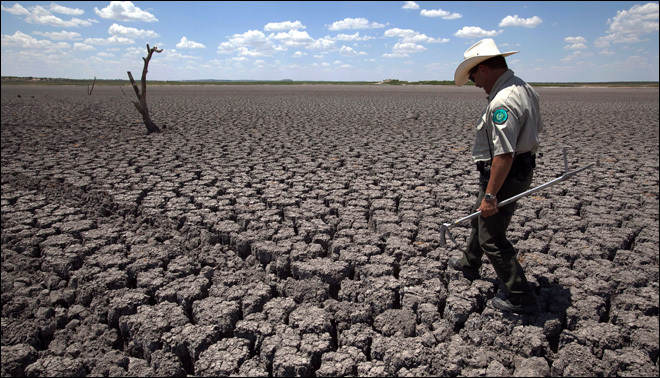 What all the evidence demonstrates is an intensifying warming trend, which is having a dramatic effects on the continental, regional and local water cycles and their precipitation events. Watching the local weather report will confirm this recurring situation, as extreme precipitation events become the new normal. Five hundred year floods now happen twice in a decade, as do 1000 year deluges. Now, only if the community of nations can come together and face these new and often brutal weather realities that are confronting every square inch of the planet. 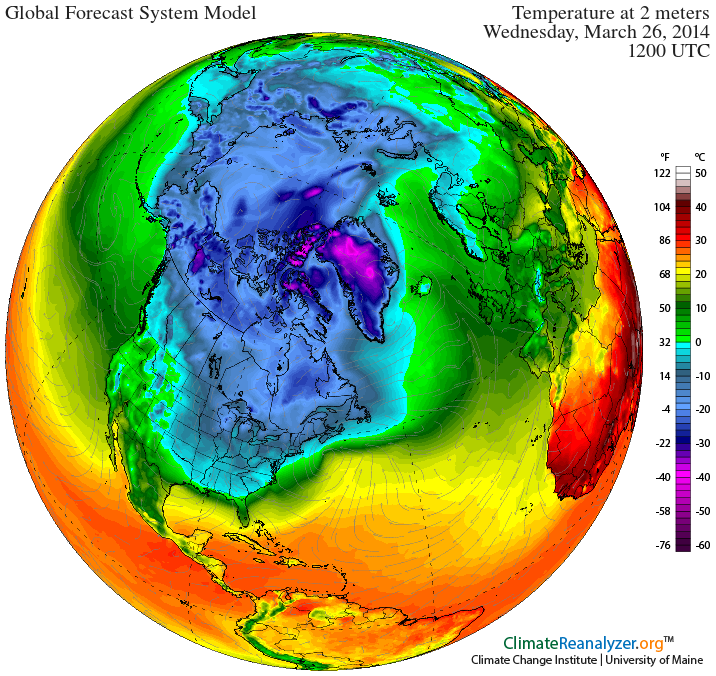 Fabricated ‘Polar Vortex’ purposefully positioned over North America. How are these headlines reconciled with all the false stories trumpeting ‘Global Cooling’ last winter? Does one winter season fraught with a few geoengineered snowstorms and ice storms constitute a new era of global cooling? Manufacturing fake ice on top of the Great Lakes doesn’t make for a credible narrative, does it? For that matter, the whole fraudulent ‘polar vortex’ storyline came and went like a flash in the pan. A very hot pan known as Global Warming, which continues to be the dominant meteorological pattern on Planet Earth. Now that the latest global cooling media craze has been exposed for the hoax that it was designed to be, the world can get back to the business of addressing the greatest challenge facing humanity — Global Warming. In order to effectively embark on such a global initiative, there must be a general consensus among the community of nations as to both root cause and treatment. Likewise, the scientific bodies on both hemispheres must reach a shared understanding as to the primary components of the Global Warming predicament. Just as the geoengineers have been playing doctor with the Earth’s atmosphere, administering invasive interventions at every turn with chemtrail concoctions and HAARP frequencies, the real scientists must formulate a plan of action that substantially addresses the warming trends. Regardless of the nonstop catcalling and denial from the naysayers, the anthropogenic causes of Global Warming must be identified and proven beyond any doubt. Otherwise, the continuing population explosion will only exacerbate the fundamental problem. Clearly delineating the proportionate mix of various co-factors contributing to the anthropogenic component is the quickest way to moderate those factors which are controllable. To persist in neglecting to address the major co-factors only wastes valuable time by kicking the can down the road — a road which can hit a deadend at any time. Yes, it’s that serious! 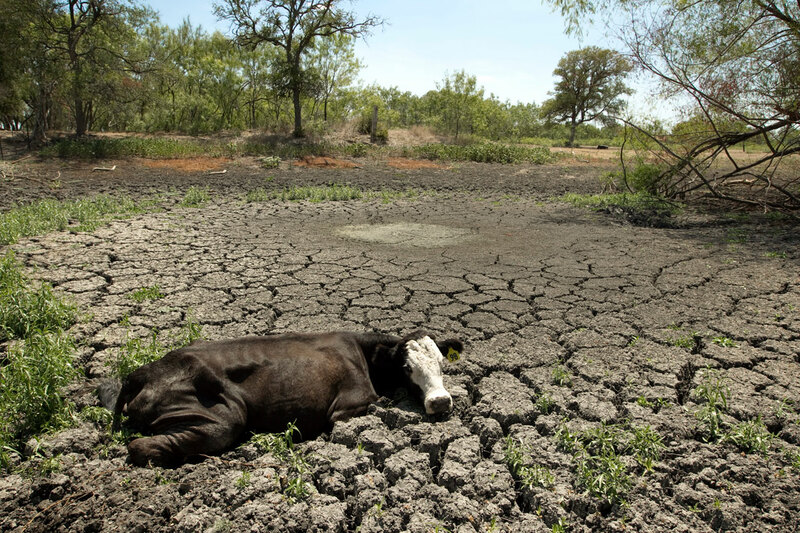 Perhaps the climate deniers and warming deniers should be put on a bus and transported to the proverbial waterless region, because that is exactly what the world may be transformed into given further procrastination. 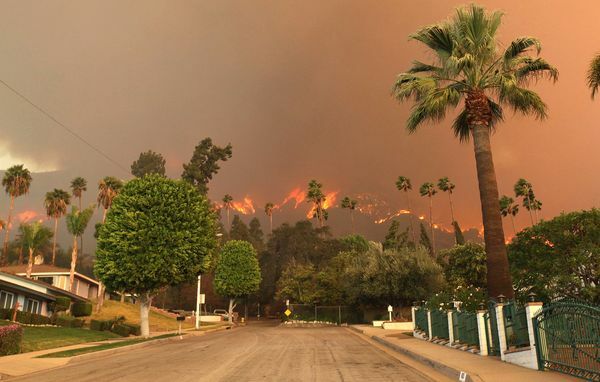 The same deniers might also talk to the good folks who live in areas that have been battered by droughts and wildfires, especially the countless forest fires and brush fires that have broken out west of the Mississippi. Whereas deus ex machina usually refers to the unexpected and spontaneous insertion of divine agency into the affairs of man to solve a seemingly unsolvable problem, it can also appear in the form of a “Godzilla”. In other words Global Climate Change (known as Godzilla in this context) ought to be looked at as the only sufficiently dangerous and threatening phenomenon that will compel the entire planetary civilization to assess the true status of things … across all paradigms, philosophies, sciences, industries, etc. The dominant societies have been so addicted to deception, for so long, that they will now only see the truth when they have been shocked into doing so. After all, GODzilla has been named after his Creator, so what else could humanity expect but a no-nonsense character who is not to be messed with lest they incur the wrath of his father. Contrary to the movie script, GODzilla is not to be bombed and shot at, strafed and corralled at every opportunity. That only makes him madder, waiting for his turn to come back fiercer and more determined and mad as hell. Isn’t that kind of what the geoengineers are doing with their various weather modification programs. 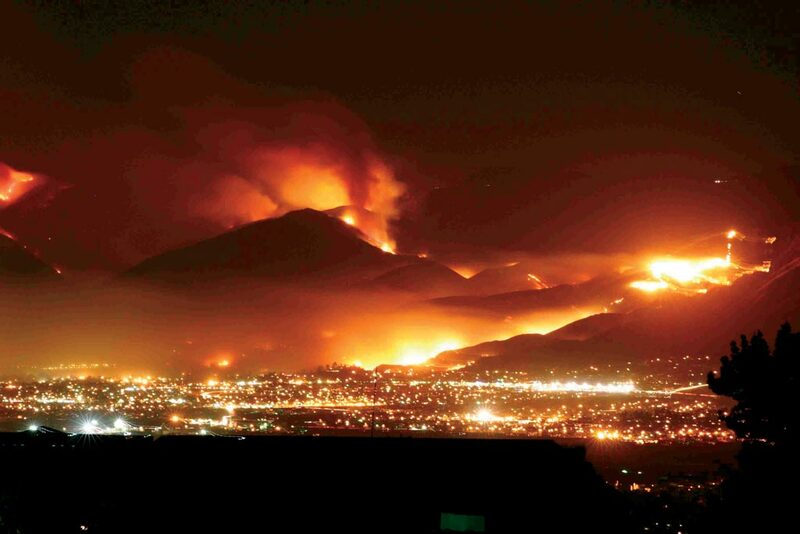 With each misguided atmospheric engineering experiment, the weather patterns just get more unpredictable and violent. The tornado swarms alone seem to tear up towns as fast as you can spell G O D Z I L L A! Likewise, every ill-advised attempt at climate engineering just seems to produce more weird and wackier weather than ever. In fact many of the resulting weather events/patterns are now known for being not just freakishly out of season and marked by extreme volatility, but also unusually destructive as in “barn-busting”. Actually, many of the more recent superstorms give new meaning to the movie lingo: B L O C K B U S T E R! Because the current trajectories regarding global temperature, precipitation, pressure, greenhouse gases, among other significant meteorological metrics, find their source at the beginning of the Industrial Revolution, it would seem necessary to start there. 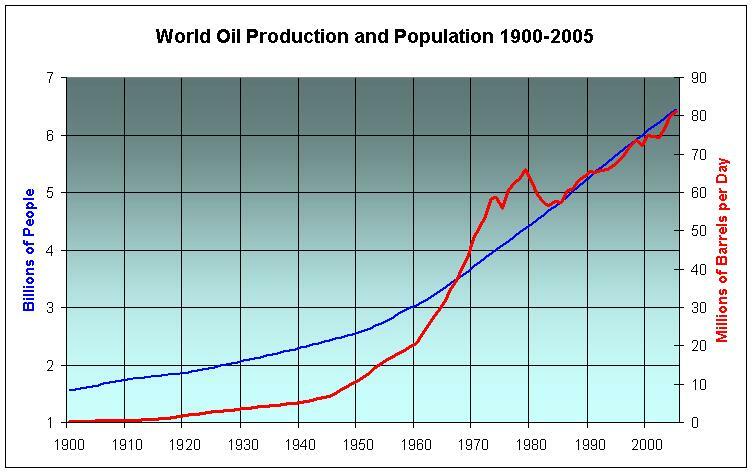 There is a very interesting and telling correlation between the increase in world population and the burgeoning use of hydrocarbon fuels, such as oil and natural gas, shown below. This graph portrays what many throughout industrialized nations would like to ignore. That the prevailing hydrocarbon paradigm has not only created an hospitable environment for the population explosion, but also that the ever-increasing utilization of more hydrocarbon energy has greatly contributed to the advancement of the technosphere. As the various structures and systems, innovations and inventions of the technosphere have been incorporated throughout the modern civilization, they continue to make considerable contributions to the earth-warming trend. So, too, do many of the other pervasive energy paradigms, such as nuclear power generation and fossil fuel, contribute significantly to Global Warming. 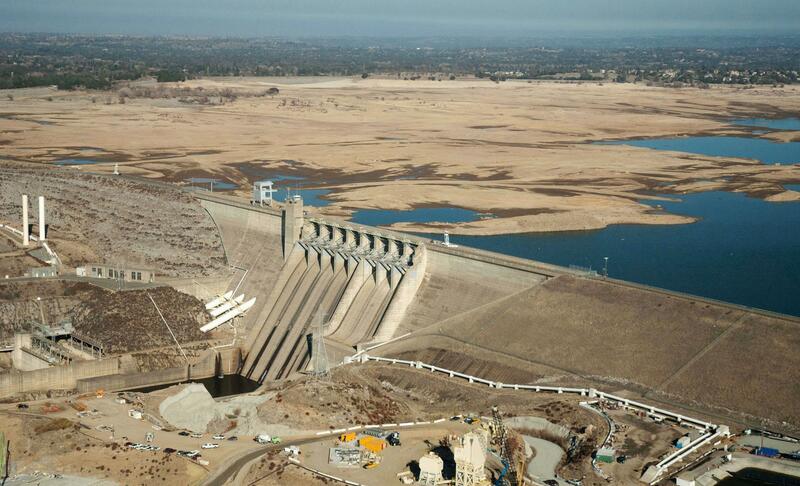 Consider for example how much water is needed to cool down one nuclear reactor. Likewise, hydroelectric plants and biomass incinerators, hospital incinerators and industrial smokestacks add to the heat quotient running 24/7 as they do. Then consider all the other human activity and manmade contraptions which generate heat — awesome amounts of heat when considered in the aggregate, all of which must be processed by a rather finite system known a Planet Earth. For instance, all the residential and commercial HVAC systems do their part at influencing the typical urban heat index. So do motor vehicles and jet airliners, trains and subways. Then there are ocean liners, oil supertankers, cruise ships and river barges. Let’s not forget the vast assortment of other heat-producing gadgets and equipment like lawn mowers and outdoor grills, power saws and weed whackers. The list is endless, and cannot be discounted because of how big the planet is. Every source of heat inevitably affects the overall system. However, it is the pollution poured into the air by all of these technospheric toys which then imbalances the natural atmospheric dynamics that keeps things cooled down. Of course, chopping down all the rainforests hasn’t helped this predicament either. Shall we go on for those who refuse to believe in the anthropogenic causes of Global Warming? The basic laws of physics clearly illustrate that the massive amounts of heat and energy and light generated by civilization must be processed. So do the greenhouse gases and air pollution produced by industry and infrastructure. Oil drilling in the seven seas triggers mammoth methane releases in addition to the upsurging and ultra-hot hydrocarbon effluent. As does the hydro-fracking of land masses create it own heat-producing dynamic. When studying this chart, remember that virtually none of this human activity existed before the Industrial Revolution began in the 1800s. Therefore, a LOT has changed, particularly in the last hundred years. 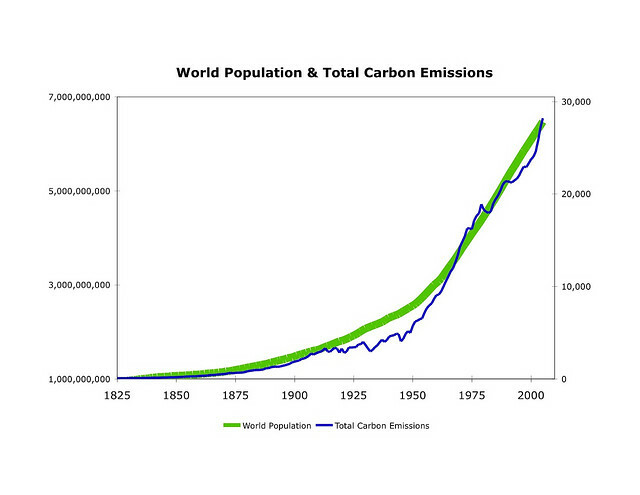 Here’s another graph charting the positive correlation between world population and total carbon emissions. There is no greater threat to the biosphere, and therefore to human life, than geoengineering. Because geoengineering has substantially intensified the current trend of Global Climate Change, it must be suspended immediately. Throwing fuel on the fire of obvious and ubiquitous Global Warming is setting up the planetary environment for much unnecessary destruction and injury to every form of life. The “pharmaceutical approach” taken by the geoengineers is, at once, dangerously short-sighted and ignorant of the most basic scientific principles. It is certain to bring about huge unintended consequences, just like medication drugs often do. Furthermore, the people who live under chemtrailed skies are guaranteed to suffer from all the toxic side effects which are caused by the indiscriminate, systematic, wide-area spraying of chemical aerosols. The animal life and plant kingdom will likewise suffer varying degrees of collateral damage. The systematic utilization of chemtrails and HAARP to conduct climate engineering will only produce the results expected from any bad experiment gone awry. The problem, however, is that the “explosion in the lab” is not limited to a university laboratory; this ongoing geoengineering experiment will profoundly affect the entire global atmosphere for generations to come. Our position is that the future of the human race now hangs in the balance, as does the fate of the planet. While Mother Earth can take good care of herself and can probably use a serious makeover, her necessary cleansing and rejuvenation will deeply affect nations large and small. Standing at the threshold of so much planetary transformation ought to inspire humankind to respond in a manner that is both responsible and collaborative, decisive and bold. Do we want to be part of the problem, or part of the solution to this awesome and quite challenging planet-wide predicament?